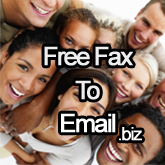 email websites Free fax to email after a quick and painless signup. Receive your faxes right in your email websites mailbox at no cost to you. Free fax to email for popular email website in the world, it is easy to use and set up. Look for your first fax in the spam box and mark it as "not spam"
Move the fax to your inbox (if your "not spam" option has not done this). You free fax to email is set and ready to use. What will the fax 2 email file look like? The fax to email file is an attachment. It is either an image (TIFF) or a PDF file. The image file requires an image viewer to see all the pages. You may do a Google search for a free image viewer with TIFF support.